A title called Dragon Age 4 has been in development for years, but it hasn’t been the same game during that time. BioWare officially announced the next Dragon Age with a trailer at The Game Awards, but that’s the second iteration of the game. The original Dragon Age 4 was shut down in 2017 to bring in more hands to help finish out Anthem’s troubled development. A new Kotaku report from Jason Schreier breaks down what’s been going on with Dragon Age 4. 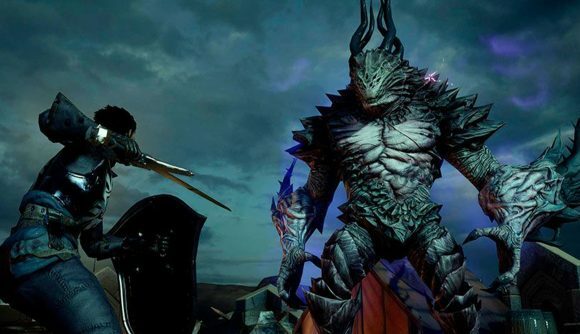 While games are often rebooted at various stages of development, the report suggests that Dragon Age’s reset is indicative of some of the broader issues at BioWare – issues which the company has now publicly acknowledged and is looking to address. The original Dragon Age 4, codenamed Joplin, entered development in 2015 as DLC for Inquisition wrapped up. It was to star a party of spies in the Tevinter Imperium, and while it would be smaller in scope than Inquisition, it would have a world more reactive to player choices. The big focus would be on heist missions that offered various ways to deal with guards and other challenges. There’s no telling exactly how many of those features would make it into the final game, but that doesn’t matter much at this point. Joplin was put on hold in 2016 as its developers were brought in to aid on Mass Effect: Andromeda, and ultimately cancelled in 2017 when the same thing happened with Anthem. The new Dragon Age 4, codenamed Morrison, is still so early in development that there’s little word on what shape it will take. EA’s continued push for live service games will likely have an effect, but exactly what that means could change many times before the game actually launches. One developer suggests it could feature a single-player main story and a multiplayer post-game, while another idea floating is that it could have Baldur’s Gate-influenced co-op. Yet another idea noted in the report is having the decisions of players worldwide shaping the game’s story. Whatever the specifics, it’ll be a long time before we see the Dragon Age 4 release date. While the series has frequently been great, its format has never been consistent, and there are any number of forms the new game could take.